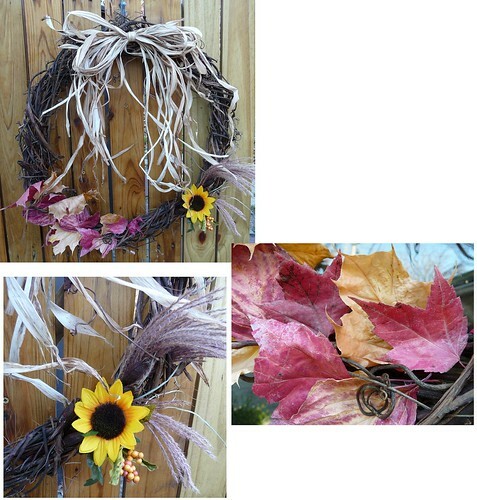 I got around to making a couple of fall wreaths. 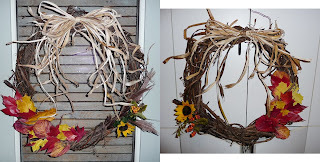 The wreaths that I blogged about earlier this year were made from the ivy that grows like mad along 80' of a fence on my property. I wandered the yard finding some interesting things to put on them except for the plastic flowers of course and that's really only because I haven't experimented with drying flowers yet! So, I used leaves from the died back Tiger Lilys to make the bow; the wooden pod stems are from some Siberian Iris plants; the fuzzy stems are from an ornamental Maiden Grass (cut when it was copper-colored); and the leaves were picked up from the yard. The fuzzy stems and leaves were semi-preserved by drying them between sheets of paper towel and nuked in the microwave for 1:40 on 50% power. Then I lightly sprayed the leaves with clear matte acrylic paint. The leaves that are on the wreath outside my back door are pretty crisp now and the color looks pretty good, but not as natural as if they were preserved with glycerin (which I've never tried). BTW, the leaves that I didn't use and put in a plastic baggy are still pliable. To put the wreath together I took a bunch of the Tiger Lily leaves and folded them into a bow shape then secured the bow by wrapping a few more leaves around the middle and used hot glue to secure it. I then hot glued the bow to the wreath. Then I stuck in the ornamental grass and the Iris stems (no glue) then layered the leaves over each other while hot gluing each one to the wreath and each other. Be careful with the hot glue because besides burning your fingers it shows through the leaves a bit so you want to make sure your glue spot will be hidden by the next leaf. Whallah! Here's what the two wreaths looked like right after putting them together. Pardon my bad photography on this one; I was rushed. The picture at the beginning of this post is what it looks like now after being outside in the elements for just over a week. The second wreath was given away right after making it.